Described in the Mahabharata, an ancient Sanskrit epic, as the “best of rivers, born of all the sacred waters”, the Ganges River holds particular significance to the Hindu people. Personified as the goddess Ganga, legend has it that the river is born of Mena and Himavat, the embodiment of the Himalayas. A deeply spiritual place for many, Hindu pilgrims will often bathe in its waters hoping to cleanse their body and purify their mind. Furthermore, you can witness one of the many cremations held on the banks of the Ganges. It is believed the grounds have holy significance, offering redemption to those who have passed away. Experience the magic of the Ganges at the many ghats dotted along the river. These are a series of steps leading down to the river, where you can board your dawn boat ride or witness a “puja” ritual. Look out for significant ghats that include Dasaswamedh Ghat, Darbhanga Ghat and Chet Singh Ghat. Hindus consider Varanasi to be a ‘tirtha’ (crossing point between heaven and earth). This city is a “must-see” city when travelling along the Ganges. Be sure to explore the old and new temples of this ancient city and don’t miss the exquisite textiles, sculptures and the many crafts produced by its people. Overlooking the River Ganges, Kashi Vishwanath Temple is a representation of the Supreme God Shiva. The original temple from 1194 was destroyed. Consequently, different interpretations of the temple were built over the following years. The present temple (built in 1780) is a stunning sight offering a rich history. So, this is one temple you have to visit! If you’re thinking about exploring the Ganges and the surrounding area, our Indian Tours & Travel Specialists consultant, Sean, suggests heading over at the start of the winter season. Between November and March, the cooler months allow you to roam freely along the banks of this majestic river, escaping the rains of the monsoon season as well as the intense heat of an Indian summer! 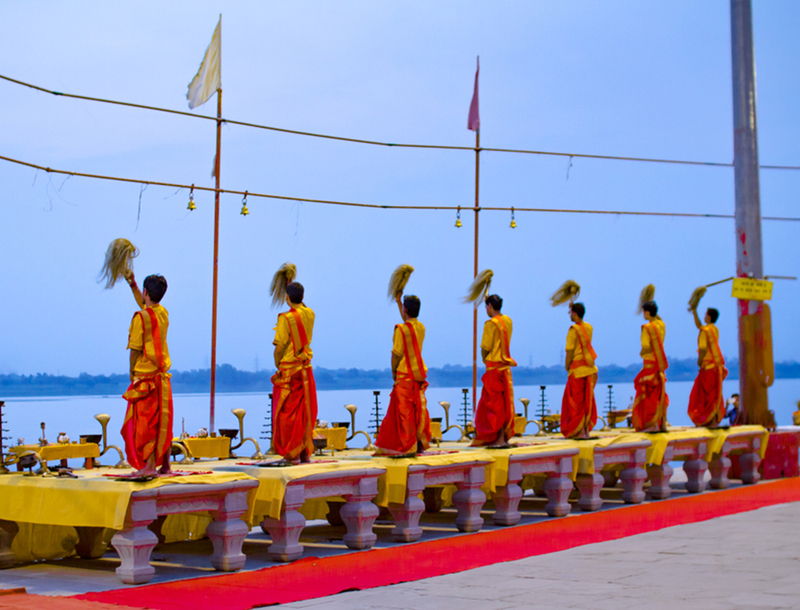 Occurring at sunset at Dasawamedh Ghat, this ceremony is a feast for the eyes. Witness young pandits (Hindu teachers or scholars) perform a complex ritual involving large flaming lamps, the blowing of conch shells and waving of incense. Used as a way to worship the goddess Ganga, you can’t miss this breathtaking display of Hindu spirituality and culture! Occurring only four times every twelve years, this religious festival has great significance to people of the Hindu faith. The festival spans eight weeks and more than a hundred million pilgrims attend. A truly incredible meeting of people and faith, many bathe in the waters seeking salvation and release from their sins. Travel through the mist at dawn, learning the secrets of India’s most spiritual river. Take the time to enjoy a peaceful moment as you witness the sun rise as the city begins to wake.